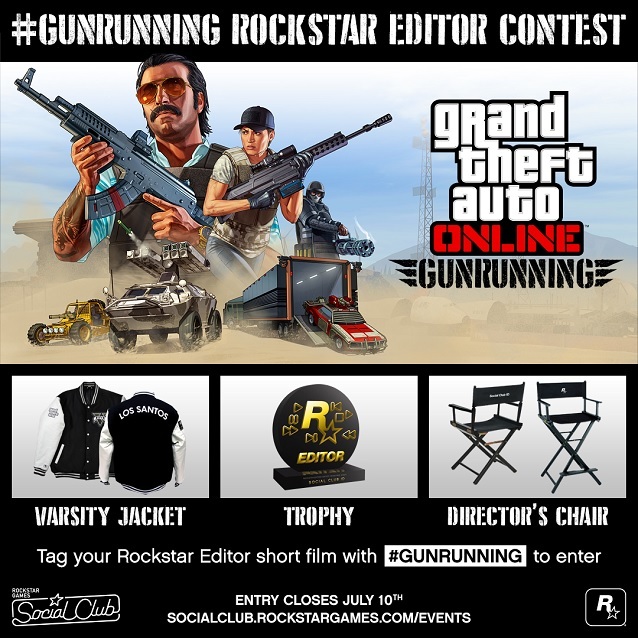 Whether you're capturing a showdown from an illicit sale gone wrong or documenting subterranean survivalists from Blaine County, use those cutting skills for a chance at the grand prize in our #GUNRUNNING Rockstar Editor Contest — the ultimate symbols of cinematic validation that are the Rockstar Editor Trophy, the customized Director's Chair and the official GTAV Varsity Jacket with customized Director's Patch. Two runners-up will also receive recognition for their efforts, each taking home a $100 Rockstar Warehouse gift card as well as an official GTAV deluxe prize pack of collectible items. • Be published to Rockstar Games Social Club, tagged with the word #GUNRUNNING, between now and 11:59pm ET on Monday, July 10th to be eligible. • Be made entirely using the Rockstar Editor. We know that many advanced Rockstar Editor video creators like to use additional third party editing software, but in order to keep this competition fair for all entrants, we require that you only use the Rockstar Editor in producing the video. After viewing all qualifying entries, Rockstar Games will pick the winner by taking into consideration adherence to or interpretation of the guidelines mentioned above, entertainment and artistic value, editing quality and overall creativity. Stay tuned for the winners announcement later this summer. Visit here for the full list of official rules. You can also score big by entering the Gunrunning Social Club Sweepstakes for a chance to win a cache of GTAV gear, including the rugged Fatigue Merryweather Security Cap, Black Merryweather Security Polo & Tee, Merryweather Security Heat Changing Mug, the Grotti Polo, Grey Trevor Phillips Industries Tee and classy GTAV Chrome Zippo. Enter at any time between now and Sunday, June 18th at the Social Club Events Page. For a limited time, log in to GTA Online and unlock both the Blue and Red Class of '98 Tees as well as the brand new Black Vom Feuer Cap. Purchasing a Bunker will also score you the white Hawk & Little Hoodie - head over to socialclub.rockstargames.com/events for full details on how to redeem your items. All standard ammunition is also 25% off - resupply at a moment's notice by opening up your Interaction Menu and selecting Inventory > Ammo. As an added bonus, Legendary Motorsport is offering a 25% discount on the Vapid FMJ and the Truffade Adder. Face your fear of heights in this week's Premium Race and Time Trial. 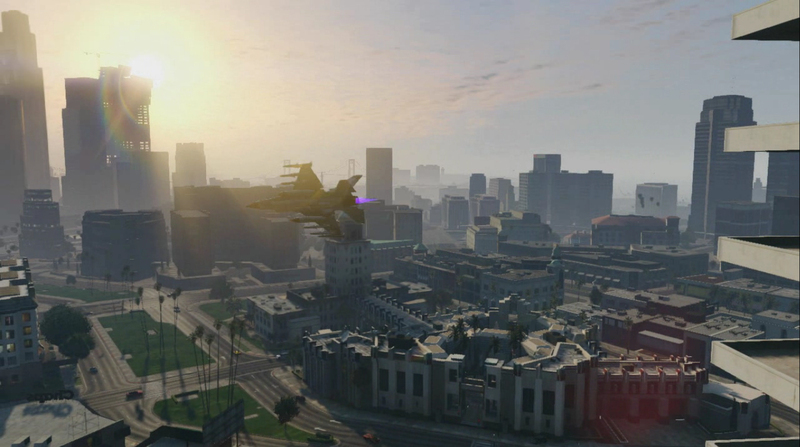 Live now through Monday June 19th, jump in your Super of choice for "Lift Off," a tricky Point to Point over Fort Zancudo, for a chance at GTA$ payouts (for placing in the top three) and guaranteed Triple RP just for giving it a go. Launch Premium Races though the Quick Job App on your in-game phone or via the yellow corona at Legion Square. Beat the par time in this week's Time Trial, "Mount Gordo," and you'll be rewarded a healthy chunk of GTA$ & RP. To participate, simply set a waypoint to the marker on your map and enter via the purple corona. GTAO Gunrunning Event - Celebrate the latest DLC release with discounts, bonuses, Snapmatic contests, and more!